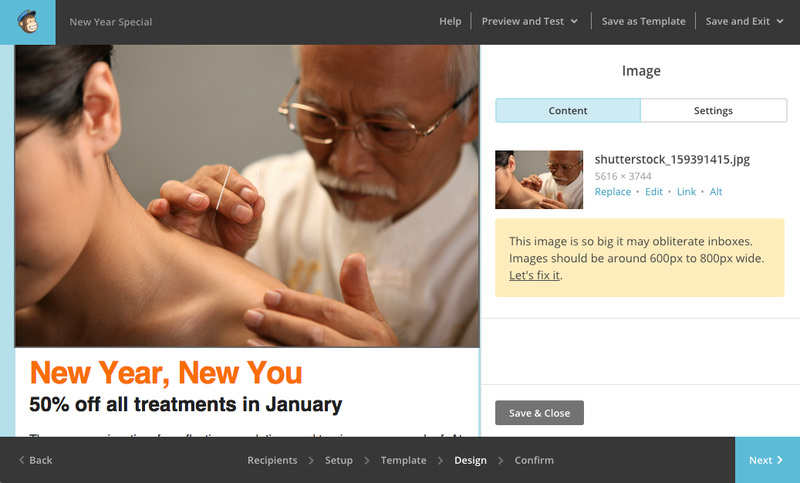 Email marketing is one of the best ways to continue and build a relationship with your patients outside of the clinic. The ability to reach your patients at a personal level and to show you care for their well being is very powerful. The benefits of email marketing is a larger topic deserving of its own blog post and I will save it for another day. When I talk to acupuncturists, the email marketing tool that most are using is MailChimp. 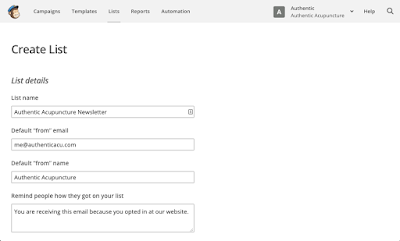 So, in this blog post, I want to give you actionable steps you can use today to start your email marketing journey with MailChimp. MailChimp is a very affordable (free) email marketing tool that is both intuitive and simple to use. A list is a group of patient email addresses. You can create different lists, for example, you might want to create a list for patients with chronic pain or a list for patients with allergies and then, you can send relevant emails to each group. Click on the "List" tab. Click the "Create List" button. Fill in the "List details". 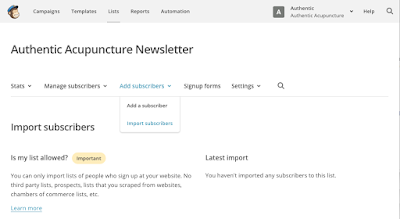 To keep it simple, let's create a list for general emails called "Authentic Acupuncture Newsletter". Now we'll need to populate our list with subscribers. 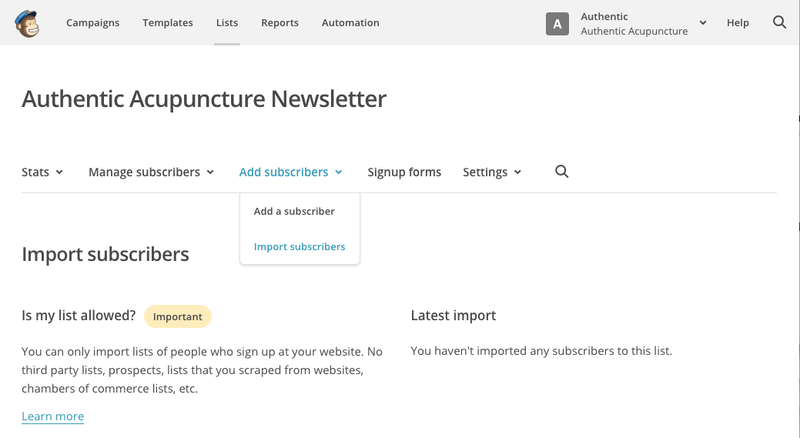 Subscribers are email addresses of patients that have given you permission to email them. A way to ask your patients for permission is to include a check box on the initial patient intake form. Click the "Add subscribers" drop down. Select an option for importing, if all your contact are in an Excel spreadsheet, click "Copy/Paste from Excel". Now the fun part begins, designing the look and feel of the emails. The email template is an extension of your brand, so you might want to follow the color scheme of your logo. Select a template that you like. 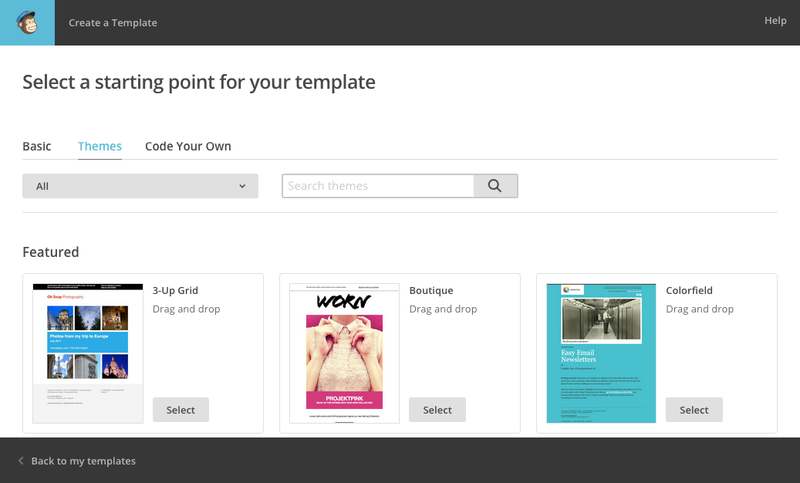 Use the template designer to make changes. A campaign is just a fancy marketing term for the email message being sent to your patients. 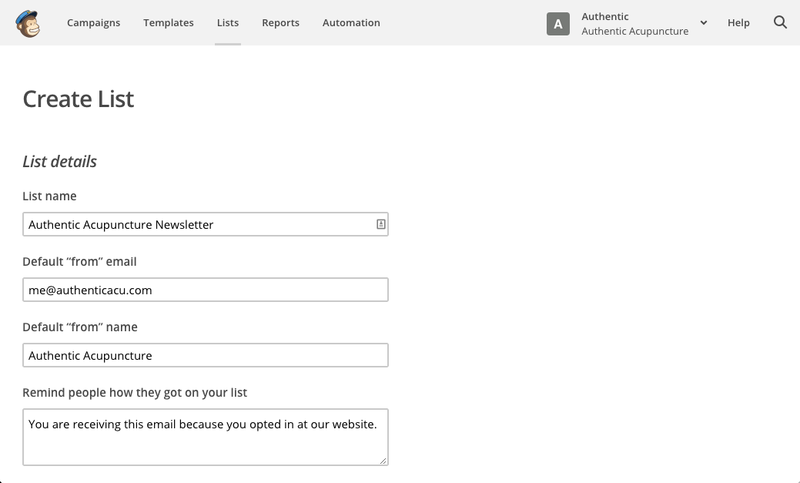 You'll create a campaign within MailChimp to send your email. Select "Send to entire list". Enter the name of this campaign and the email subject, I like to make them the same. Design the email with text and images. Here, I like to keep it simple. Test the email, by clicking on "Preview and Test" -> "Send a Test Email". When you're satisfied with the email, click the "Send" button. Jasmine helps in that it is a central location and repository for patient contact information. And since Jasmine is built on the Salesforce platform, a MailChimp for Salesforce plugin exists to sync your patient information from Jasmine into MailChimp. As always, I love hearing from you. Please leave comments below or email me at mintotsai@jasminepm.com.